Today is the 200th anniversary of the end of the War of 1812. The hostilities formally ended on February 17, 1815, at 11 p.m., when President Madison exchanged Treaty of Ghen ratification documents with a British representative. My great-great-greatgrandfather, Lyndes Willis Pettibone – or, as we’ll see, perhaps his father or another person with that same name – served in this war as a musician. I have not yet been able to connect all the dots unequivocally, but this post presents what I’ve found out so far. Since Chauncey Sr. died in 1801, one can presume that he may not have become a sufficiently “temperate man” to have inherited his share. I hope someday to learn what happened to Chauncey Sr., his wife (Hannah Merrell) and Lynds and his siblings during that first 19th Century decade. Lyndes Pettibone reappears in 1812. Official records show that he twice enlisted to serve in the War of 1812: on June 14, 1812 and on August 8, 1814. In this latter record, his age is given as 18, which implies a birthdate around 1796. New York and Brooklyn city directories show Lyndes W. Pettibone living there — and there’s also a Pettibone & Peters clockmaking business in Brooklyn. (Source: Brooklyn Eagle, 7 May 1846; viewed on 3 March 2008). Lyndes & Hannah had two children in New York, Emma Louise (1847-1901) and Fannie (1852-1879). Emma, who married Charles Franklyn Seymour (1839-1877) is my great-great grandmother. The family moved to Alabama in about 1852-3, according to Fannie’s obituary printed in an unidentified Alabama paper. L.W. Pettibone is listed in the Alabama Civil War soldiers index –The War for Southern Independence. No military unit or company is given. On page 47 of the “Confederate Papers Relating to Citizens of Business Firms (National Archives Microfilm Publications Pamplet Describing M346, L.W. 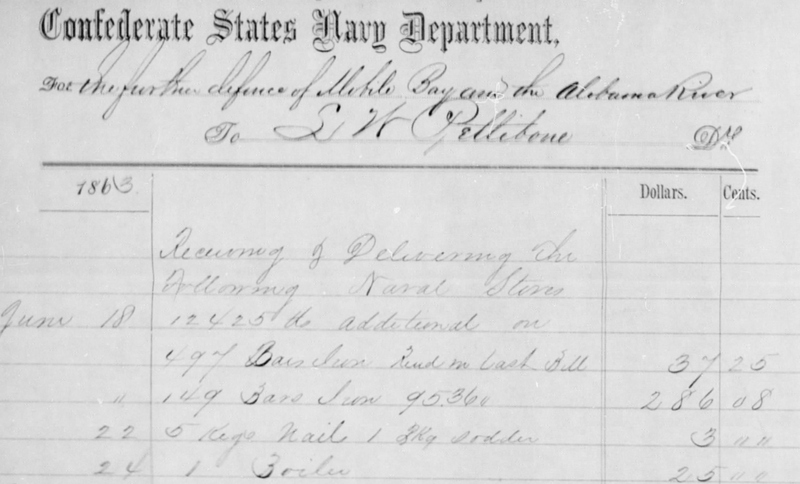 Pettibone of Selma, Ala., is listed as being an “Operator of receiving and forwarding house; supplied arms, ammunition, iron, lumber, coal, foodstuffs, and assorted hardware items, 1862-64,” for the Confederate armed forces.  (L.W. Pettibone) Todd, Geo. Was he a slave holder and/or a plantation owner? I don’t know for sure. While L.W. Pettibone is listed on the 1867 voter registration rolls for Dallas County, the Dec. 1, 1866, Selma Weekly Messenger contained an ad naming the “successors” to his business. There was no mention of the motivation for this change. Did Lyndes simply sell the business? Or did he retire, relocate or die? As one can imagine, the main sources of potential confusion are the first-name variations in various records (Lyndes, Lynds, Lyons & L.W.) and the age discrepancy in two important documents: The War of 1812 enlistment records imply Lyndes was born about 1796, and the 1860 Census implies he was born about 1813. It’s impossible to say which might be more likely: 1) That there is one Lyndes, whose age on the 1860 Census is wrong, or 2) There are two Lyndes Pettibones, one born about 1796 and the other about 1813. If there are two, perhaps they are father & son … or unrelated. According to marriage records, Emma L Pittibone married O F Seymour (CF) on 09 Mar 1870. In Dallas, Alabama, United States. The name Pettibone is spelled in different ways in the records so if you don’t find anything, try a variation of the spelling. If you’d like to help me delve further into this, please send me your e-mail address to me at mikeross2 -at- prodigy -dot- net. I will then delete this message/comment. Robert A. Pettibone’s wife was Rosa A. Pettibone also called Rosalie or Rosella. Their son was named Daniel. Lyndes W Pettibone was the administrator of Robert’s will when he died in 1872 in Fulton County Georgia.